After 17 years of marriage, Bubba still claims that I drive him absolutely crazy. One of Bubba's (perhaps legitimate) grievances with me has to do with the celebrating of birthdays. Specifically, my birthday. You see - it turns out that I am a big old birthday hypocrite. I love to celebrate other peoples' birthdays. Particularly the "gift" part: I legitimately enjoy thinking of what that person may want/need and procuring it. I genuinely enjoy wrapping gifts. I really love the whole gift-giving ritual. Notice that I said gift-giving not gift-receiving. Yes - as much as I love to give birthday presents, I really hate to receive them. Or more precisely, I hate to receive them on the actual day of my birth. I get a little cranky just thinking about it. I hate the idea that there may be absolutely nothing that I want, or that I need, and yet just because the calendar shows a certain date, people feel obligated to go out and spend money on me. Like I said, it's hypocritical, I know. But there it is. So my family and I have come to an agreement: my parents give me money ("universal gift certificates!" Wheeee! ), my sister ignores my birthday altogether (probably serves me right) and Bubba gives me an IOU - good for one present of my choice when and where I find it. Some years, it literally takes me months to figure out what I want, which makes the man utterly insane. There was the year that I decided the week before Christmas that I wanted a Cuisinart Griddler*, which I then bought for myself as a birthday present (This made Bubba crazy because then he had to give me another IOU for Christmas as there was nothing that I wanted/needed for that holiday...) One year, I didn't find anything 'til the following February. So this year was no different in one respect: I got an IOU, and Bubba got an ulcer. Except this year I didn't make him wait 18 months before I redeemed it. Nope - thanks to an incredibly good email coupon from Borders last week - I got this year's birthday present. And it's a doozy. 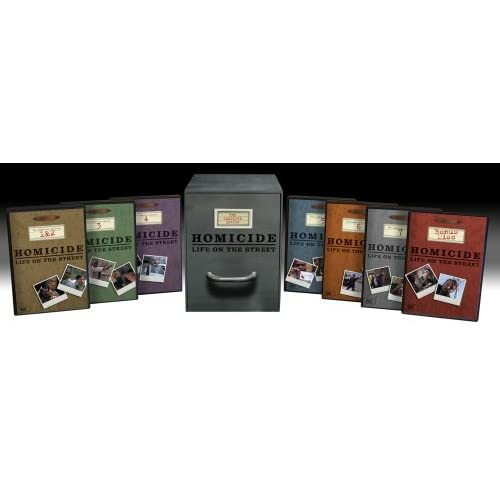 I got the complete Homicide: Life on the Street DVD set. ONE HUNDRED AND TWENTY TWO glorious episodes of absolutely amazing television writing. So much TV that they had to package it in a freakin' filing cabinet! Thirty-five discs! Totally impractical, and yet it's making me so happy. So, that's a lot of goodness right there, right? You'd think a girl couldn't have a nicer week, right? Wrong! It got even better!!! 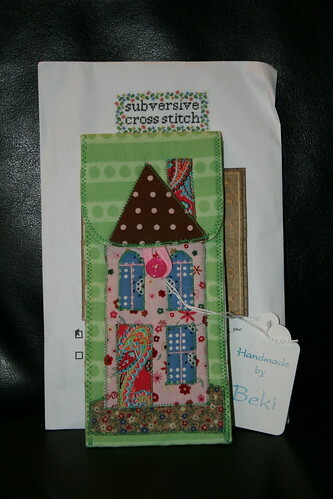 Eagerly I tore into it - to find a lovely and thoughtful birthday package from Beki, of Artsy-Crafty Babe! What's that? You need a closer look at the cross stitch kit? That's all you're getting right now - a picture of the packaging. I'm waiting until I am done with the actual kit before doing the "big reveal." This shouldn't be too terribly long now - I am LOVING the cross stitching. I've not cross stitched anything since I was a little kid - probably still in single digits, agewise? I'm delighted to say that it came back quickly, and I am having an utter blast with this. I will give you a closer look at the sunglasses case, though - because it's so amazingly cute. And it is the perfect size for my big old goofy sunglasses. ACK! That sunglasses case is SO CUTE! Awesome. 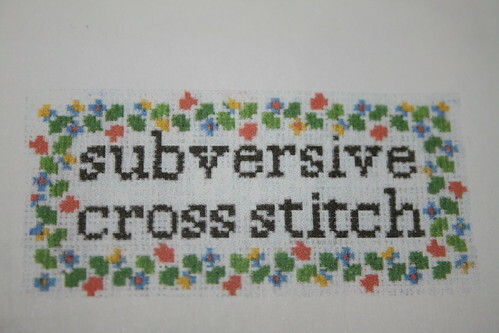 And I'll be anxious to see what kind of subversive cross stitching you come up with that you can display in a house with a young son. Of course the ones with vivid curse words are hilarious, but now that I'm a mom of young kids I find myself doing things like singing, "kicked him in the LA LA LA" when stuff like that comes on the radio. Happy late birthday presents! 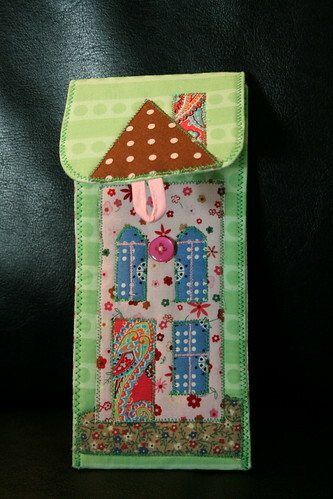 Cute, cute sunglasses case, you lucky girl! And apparently my alzheimer's has kicked in -- I don't remember that Homicide series. Oh wait, I was probably too young then...yeah right, that it! 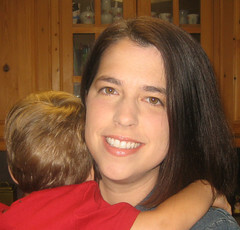 "my sister ignores my birthday altogether " - yeah, well she's a FL repubbie. So, 'nuff said! I LOVE Homicide! I think it's my favorite show of all time so I really, really get why that DVD set makes you so happy. Funny enough I have the DVD set yet I still TIVO the show & watch it daily. 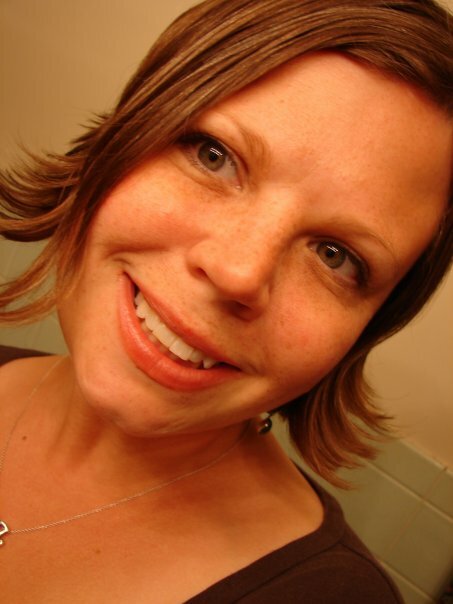 I love the fells point photo! So cool! That gift thing would drive my husband nutty too. But that is one aggravation I don't give him- you are making me feel materialistic & shallow because I always have a million gift ideas. ; ) I even have a folder in my favorites labeled "wants." (And hmmm...that griddler thing - looks pretty cool.) Enjoy your dvd extravaganza! Didn't realize it was near your birthday. Oh, how I loved Homicide when it was on TV. Looks like a great gift for me. 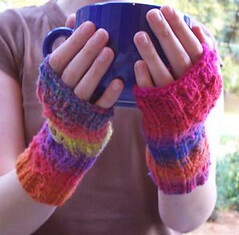 As for Christmas, hubby and I now get something for the house that we both want as our gifts. It's worked out great for two years now. My guy never knows what he wants as a present, but tends to buy himself (not from IOUs, just shopping) presents right before his birthday and Christmas. One year he actually bought a Kitchen Aid mixer a week before Christmas (he wanted to make cookies!) and that was exactly what I was going to get him. I'm like you about the gift giving, so I was upset. We now have a strict rule that nobody can buy anything for themselves within a month of Christmas or birthdays. OMG! I LOVE that sunglasses case! TOO cute! also...Homicide is one of my favorite t.v. shows of all time...ranks in the top five...right up there with Buffy! I'm just confused. So, it's actually a couple months after your birthday then? I think so. Are you trying to baffle me? I like the universal gift certificate, and the IOU. 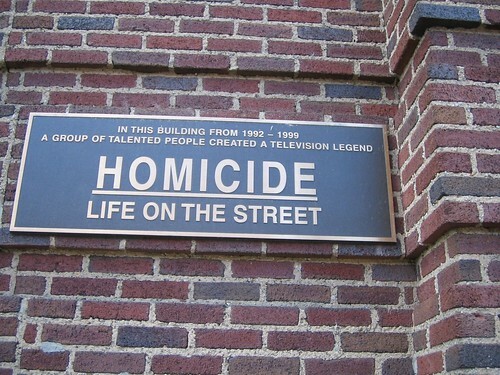 Homicide, Life on the Streets, I love that show. Now, how long's it going to take you to watch it all? had to go see what this griddler looks like. do you make panini? you are something else. all that restraint. i doubt i could wait a week to pick out an IOU. perhaps there is a future for you in forensics? surely there's a program in your metro area? or you just like watching it? i bet you'd make a perfect investigator! or crime scene photographer!